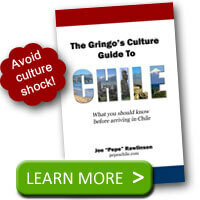 How to say goodbye in Chile is a little different from what you may have learned or seen elsewhere. Your basic Spanish class taught you how to say goodbye to some one. You learned to say adios as you depart. 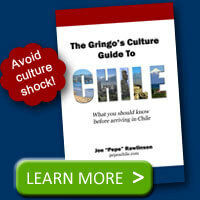 In Chile, you won’t typically hear adios. When you depart a friend’s house or leave a group you’ll say chau or chao. When I first heard this I was a little surprised. I thought I was in Italy. Pronounce chau with the “ch” of “church” and the “au” like the “ou” in “out”. It sounds like “chow”. In addition to a single chau farewell, you’ll also hear the rapid double version: chau chau. It seems like adios is reserved for a more finalized good bye where you’ll never see the person again. However, even in those cases, chau is often used. Remember that in Chile, you can’t just say goodbye and leave. You need to personally say goodbye and give handshakes (formal settings), hugs, or cheek kisses to everyone you are leaving behind (give cheek kisses if you’re a woman or saying goodbye to a woman). 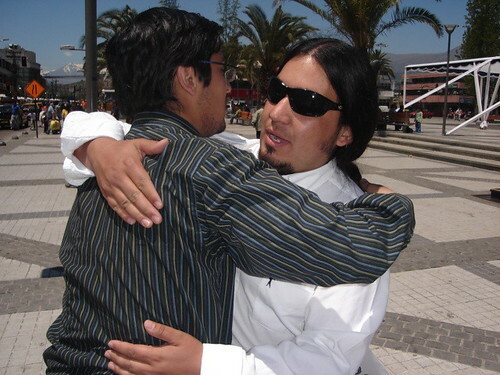 Departures are essentially the opposite of how you greet people in Chile. If you arrive with a flurry of hugs (abrazos) and kisses (besos), that is how you’ll leave too. Make sure you save time for a proper departure. You don’t want to offend anyone in the group. It takes a while to kiss and hug everyone, especially in a larger group. Chileans also love to sprinkle in English words occasionally during normal conversations. In place of chau, I’ve heard the Spanish pronunciation of “goodbye” or “bye bye”. However, as a foreigner in Chile, you shouldn’t use English words trying to be cute. Say chau and everyone will know what you mean.